My wife and I depart from our new city of Richmond VA on a cold November morning to sample some of the adventure travels that await us in the western Virginia mountains. We have planned this overnight backpacking trip for weeks. But we are fresh from residence in balmy Florida. Forecast for the mountains calls for snow and a low temperature in the 20s. Camping plans are quickly cancelled. Instead, we are opting for a day hike. The drive to the trailhead promises remoteness. We have the first 47 miles of the Blue Ridge Parkway from Staunton to ourselves as my wife carefully drives us through the magnificent fall colors of brilliantly colored forest along a parkway that is being dusted by a light snowfall, shrouded in parts in a thick, soupy ridgeline fog. For Floridians, this is an unusual treat. We get off the parkway, and the trail book instructs us to take a series of forest roads, the last of which is a jarringly bumpy gravel road that takes us deep into the national forest. A perfect route for solitude. Indeed, our daylong hike this day will see no one until we reach the hiker highway – The Appalachian Trail. Snowfall and chilly, partly cloudy weather greets us as we begin our hike. Below us for much of the way is a downslope below us and an upslope above us – both of which seem to be endless. The forest and trail appear pristine, and the fall colors impress us. The trail and forest floor we walk are blanketed by a layer of fallen leaves up to a foot in depth. Along the way, our briefly unleashed (and naughty) puppies decide to run off in pursuit of who-knows-what. After 20 minutes of calling and searching, they finally return to us. But not before they have adorned themselves with one of their favorite hiking treats: “Puppy Perfume” (where they happily roll on their back to apply a scent only a female canine can love. Essence of dead fish. Aroma of deer poop. Fragrance of rotting mouse carcass). 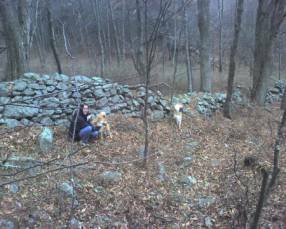 Earlier, we pass a few very attractive, historic stone wall pasture fences. The trail passes through a forest that seems to provide an abundance of attractive places to camp. Despite the drought the state is now experiencing, we cross a number of clear, cold creeks. As we near The Appalachian Trail, we find a well-built lean-to for sheltered camping. 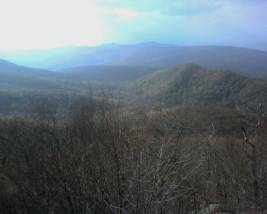 The Appalachian Trail near the Old Hotel Trail provides a highly rewarding experience. The Trail passes over the summit of Cole Mountain. At this open, 4,000-foot elevation, we enjoy a panoramic, breathtaking 360-degree view of the western Virginia mountains. The George Washington National Forest is aglow for us on this day, as we see a kaleidoscope of fall colors blanketing the mountains for miles in all directions. At Cole Mountain, the Trail follows an open ridgeline for quite a distance, affording a magnificent view into mountain valleys on both sides of the trail.